* one wood chunk measuring approximately 1.5" x 2.125" x 5.5"
* one thin piece of wood measuring 2.125" x 3.375"
* one thin piece of wood measuring 2.125" x 1.75"
This fridge/freezer can be set on either end, depending if you want a top or bottom freezer model! 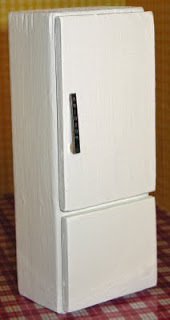 For another idea on miniature fridge / freezer handles see our later post. oh! just what i was looking for!!! and the pen clip for a handle...great idea! Wow! The finish looks great!!! 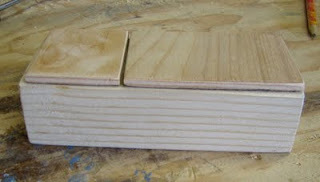 I love making things for my BIG dollhouse!